When we decorate for Christmas, we usually just decorate typical things: putting up a Christmas tree, placing a wreath on the door, and perhaps putting outdoor lights on our house. But the chicken house in your yard can be a fun spot to add cheer and decorate for the holidays too. As Americans rediscover backyard chickens and maintaining chicken coops, we seem to increasingly enjoy the aesthetic of the small house in our backyard that houses our feathered egg-laying pets, and as these coops take on diverse forms that often emulate or match your home’s design and landscape, extending Christmas decorations can be another way to make them homey. 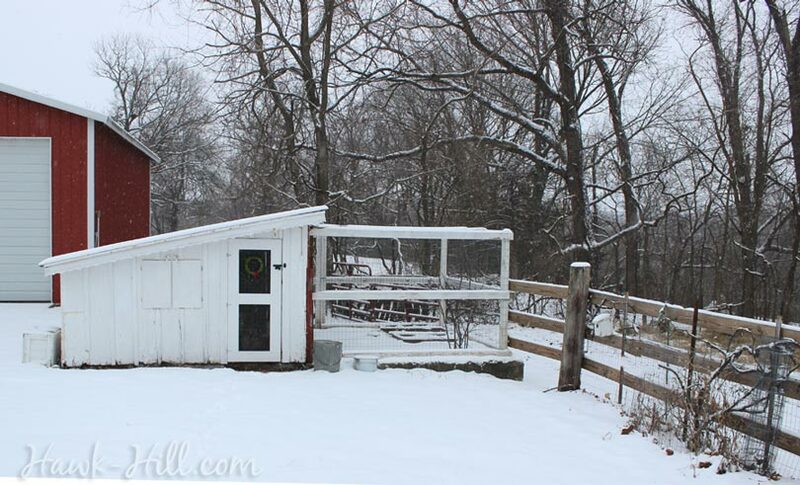 I have always included Hawk Hill’s barns, coop, and outbuildings in my outdoor Christmas decorations. Below you can see some of the ways in which I decorated my entire farm for Christmas. 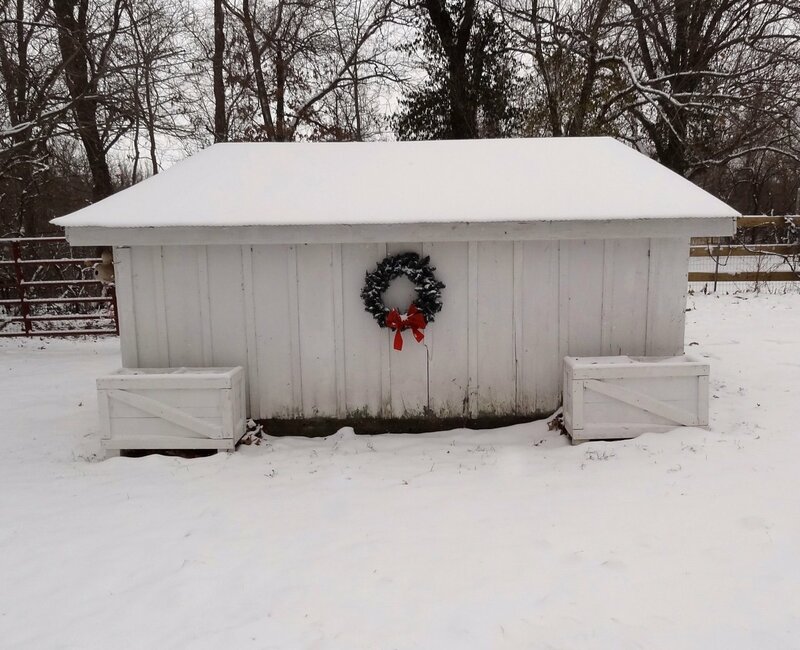 Outfitting extra buildings like chicken coops and stables can be an added expense, but making your own wreaths, and buying decorations in the off-season are great ways to affordably grow your outdoor Christmas decorations. You can read about my equestrian themed Christmas decorations on another post, but today I wanted to write a quick note about decorating chicken coops. Chicken coops, are prime spots for unexpected Christmas themed surprises. For my coop, I hang a tiny wreath on the human door to the coop. This miniature wreath is made with artificial boxwood, but could easily be made with fresh greenery and a little bit of floral wire. The fun thing about making small decorations, is that they are easy to experiment with what you have. Unlike a large wreath on your front door that will welcome visitors off-season, decorations on the coop probably don’t need to look professional up close. On the side of the coop that faces the roundabout driveway, I place a full-size wreath- which looks extra-big because of the sloped style of my vintage coop. Some years, I take these flower planters I made from shipping crates and, after clearing out the debris of fall plantings, place fresh-cut Evergreen boughs- cut from the hedgerow at the property line of hawk hill- and partially bury them in the dirt. Kept cool by the December climate of Missouri, and damp by burying the cut ends and dirt, the Evergreen boughs stay fresh for weeks. I’m still keeping my eye out for some large, durable, outdoor Christmas ornament type decorations to add to the Evergreen boughs in my flower planters. An image from the chicken chick showing one way to place evergreen greenery in an unused flower planter over the holiday season.